Running a back up can save your bacon…mmm, bacon. Recently I read a post over on InkyGirl.com, the blog of writer/illustrator Debbie Ridpath Ohi, where she talked about a routine update erasing a large number of her illustration files. If she hadn’t had a full back up system in place she would have lost file after file. Imagine watching files disappearing from your hard drive literally right before your eyes. Um, how long had it been since I did a back up? 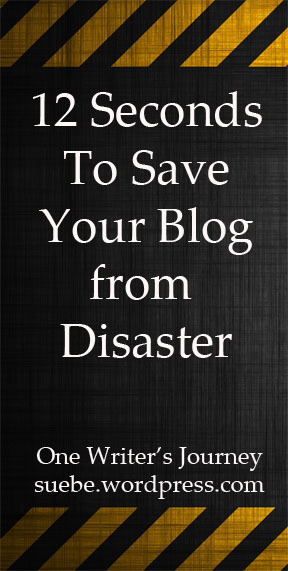 It only takes a few minutes to run the back up on each blog. If you’ve never done that, just go to Tools, select Export. Then you have to select what to export whether it be full content, comments or specific pages. I back up my entire content. Umm, right. Apparently the latest version of Norton only has that feature if you pay for the upgrade for Premium. Glad I found that out now. Still not super duper happy with Norton. Double check that back up plan! If you’re a blogger, this post is for you. If you aren’t a blogger, check out my post tomorrow at the Muffin. Maybe after reading why I blog, you’ll decide to do it too. Most of us get it. Back up your hard drive. But how many of us take the time to back up our blog? Granted, it doesn’t seem likely that someone would hack my blog or that WordPress would have a melt down but I’ve been blogging since November 2008. That would be a lot of content to have swirling down the proverbial loo. Here are 3 easy steps to back up your WordPress blog. In the left hand sidebar, click on Tools. When the menu pops up, select Export. When it asks which one you want to do (you’ll see what I mean), again click Export. The purpose behind this command is to allow you to export your data to another WordPress blog but it is also the best way to quickly back up your blog. It took me less than a minute to back up this blog. Now, if you’ll excuse me, I have several more back ups to run. Most of us have the message — back up your hard drive. But how many of us take the time to back up our blog? When the menu pops up, select Export. The purpose behind this command is to allow you to export your data to another WordPress blog but it is also the best way to quickly back up your blog. It took me 12 seconds to back up this blog. Now, if you’ll excuse me, I have several more back ups to run. Have You Run a Back Up Lately? Fortunately, my husband was prepared so he was cool and calm. Too bad this fellow didn't plan ahead. Last week, my husband’s hard drive went adios. The computer no longer recognizes it. It won’t read. It is a deluxe paper weight. He spent a bit of time checking on the warranty (hurray! one year left!) and then prepped for the replacement. But it was only no worries because he was ready. This was actually his back up drive but because he had copied files elsewhere, he was still ready for it to go. Would you be this calm if your hard drive went down? Or if someone hacked your blog? If not, start running those back ups!